To travel to Ethiopia is to experience the old Abyssinia, in an African country with more monuments and localities declared heritage of humanity, than anywhere else and where the locals have their own unique alphabet, the Amharic. Ethiopia has a fascinating history with a strong link to Christianity. Thanks to this, you can find numerous churches, chapels with handmade paintings, cathedrals and a good number of practically forgotten monasteries in Lake Tana. You can also, still visit the remains of the ancient monarchs who ruled the country before being invaded by the Italians, who made Ethiopia their African capital. In spite of this, the territory can be proud to be the only one on the continent to have not been colonized. Inhabited by different ancestral tribes such as the Oromo, Afar, Tigray, Sidama or the Welaita, among others, Ethiopia has a rich culture and traditions that seduce the traveler. Experience the colorful culture in the Bati market, to see how the different ethnic groups sell their livestock and are awe-struck by Lalibela, the second holy city of the country whose churches carved in rock are one of their greatest treasures. Amharic is the official language in Ethipoia, although many tribal languages are spoken in the country such as Oromo and Galla. There are no mandatory vaccinations for travellers from the US. 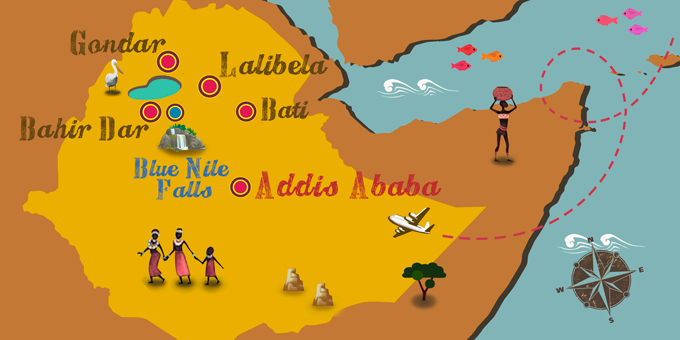 If Ethiopia has caught your attention, leave us your number so we can call you to discuss the voyage that awaits you.